contact us and tell us about it. 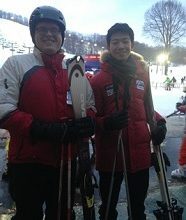 Although he has skied several times in his home country of China, Tao, or Alex, had not skied in two years until his joining his host family on a recent ski trip. Alex, who is a 16 year-old student in Michigan, noticed that for him, the main difference between skiing in China and Michigan was the tree-spotted scenery. He especially appreciated skiing down a path lined on both sides with trees, as well as the trees that existed on the backside of the mountain. Alex’s host brother (who is also named Alex) and another student named Thomas, who is from Korea, were also a part of the excursion. 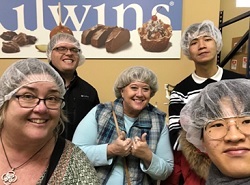 “I developed new friendships with the boys I went with, and I enjoyed time with my family too,” shares Alex. Cindy describes Alex as easy-going with a competitive edge, and an adventurous eater. “He is very easy-going, but when playing board games his competitive nature comes out! 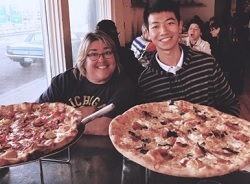 He’s always up for trying new foods, and I’ve discovered that pizza is his favorite – especially the BBQ pizza from Jets (a popular local restaurant),” she shares. 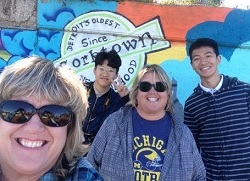 Alex and his host family have engaged in several other adventures together, such as exploring the Michigan train station, Belle Isle, Eastern Market, and streets with famous graffiti in downtown Detroit. Their next adventure will be a visit to Ohio for spring break to attend soccer games. As for his future plans, Alex aspires to study either Economics or Artificial Intelligence. We look forward to following his journey and wish him the best of success in his future adventures! © 2019 Private & Public School F-1 Exchange All Rights Reserved.